Hello there! 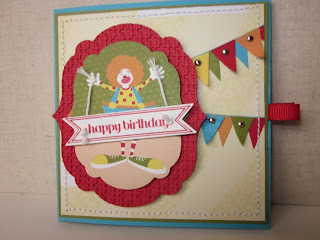 Welcome back to the 2012 Artisan Finalist Blog Hop! I hope you have been enjoying all of beautiful projects that have been posted over the last three days, boy the competition was stiff! I really don't know how SU narrowed down the list to just ten! Welcome to those of you that hopped over from Amy O'Neill's blog, I just love her projects! This is one of my five card entries. 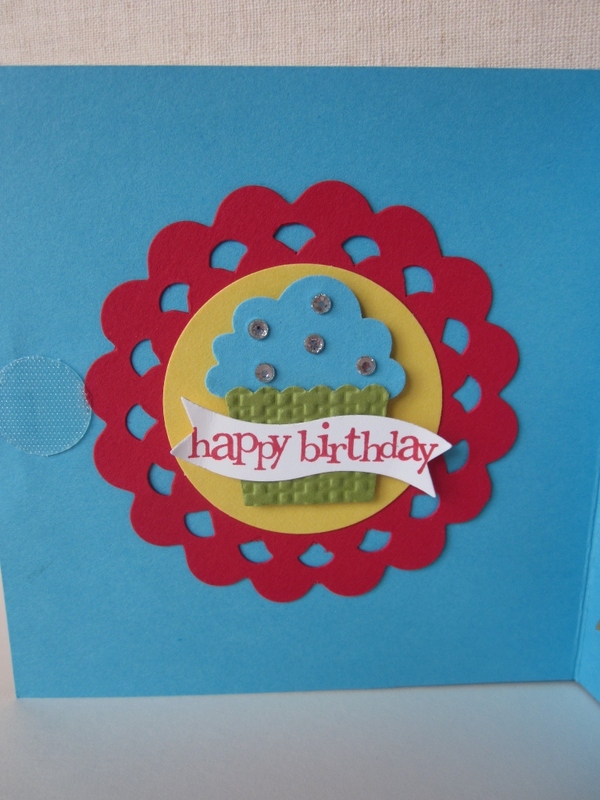 I wanted to do a variation of cards, so this is a little 4x4 gift card holder. 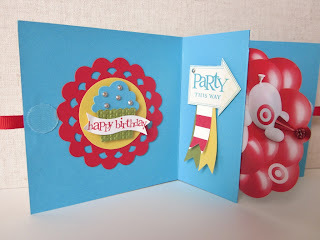 I featured this tutorial HERE on my blog last year, it is a really cute way to showcase a gift card. This card is a great example of using your patterns on the designer series paper for either your main image or as an accent. The first picture, I just punched out a bunch of pennants and attached a mini brad and layered them on the printed DSP. 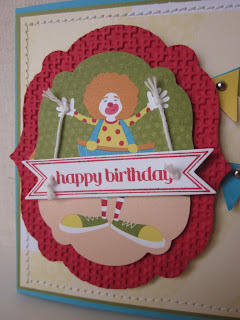 In other two pictures, I actually used the clown as my main focal point. The clown was die cut using the labels framelits. I originally wanted him to be holding the sentiment above his head, but I just couldn't get it to look right. The itty bitty banner stamp set/die combo was just the perfect size and shape for the clown to hold. Here is the inside of the card that shows how the gift card sits right in the middle. I have clear velcro dots to hold it closed, and little real red ribbon to help open and close it. Who doesn't love cupcakes on your birthday! 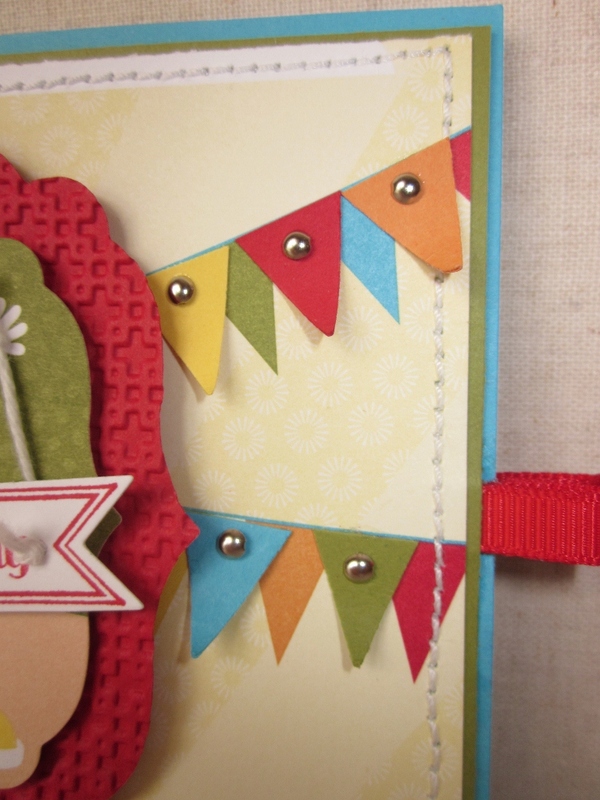 Little basic rhinestones and the bitty banner framelits just work perfectly! Another project down, seven more to go! 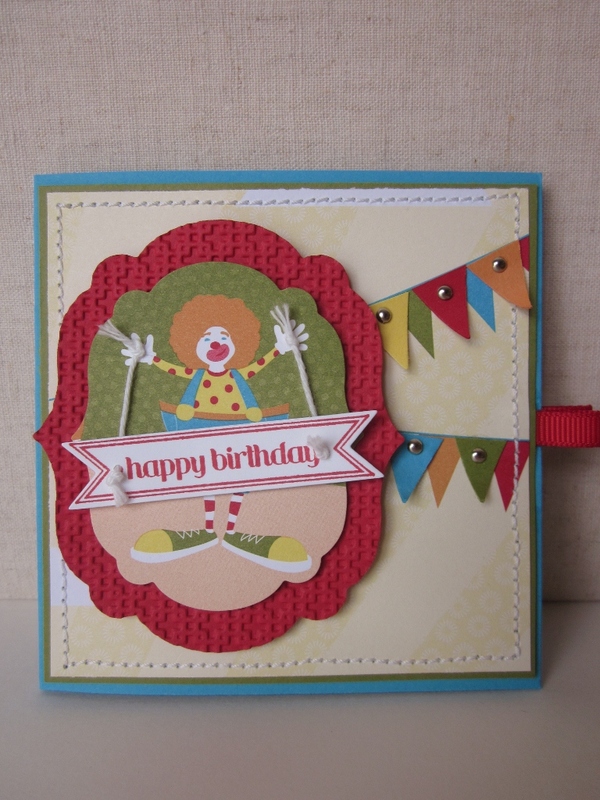 I really enjoyed making this fun little card, try the tutorial out for yourself, you can really make it your own. Hop on over to Amy Roger's blog at Amy's Stampin Creations for the next awesome project! Thanks for stopping by today, I hope you were inspired, enjoy. WOW! What an amazing and intricate card! I just love that little clown holding the birthday sign, and your embossed frames! Great, great project! This is such a fun card. This is one of the reasons I wanted to have a blog hop. There are some amazing details that just can't been seen when the cards are just hanging on the board 5-10 feet away. Love the gift card holder idea. I'll be checking out the tutorial so I can make one (or a dozen) of my own. I'm so glad I got to see the details - you can't see all of the work that went into from the board at Convention. Oh Sandie, this card is sooooo cute. 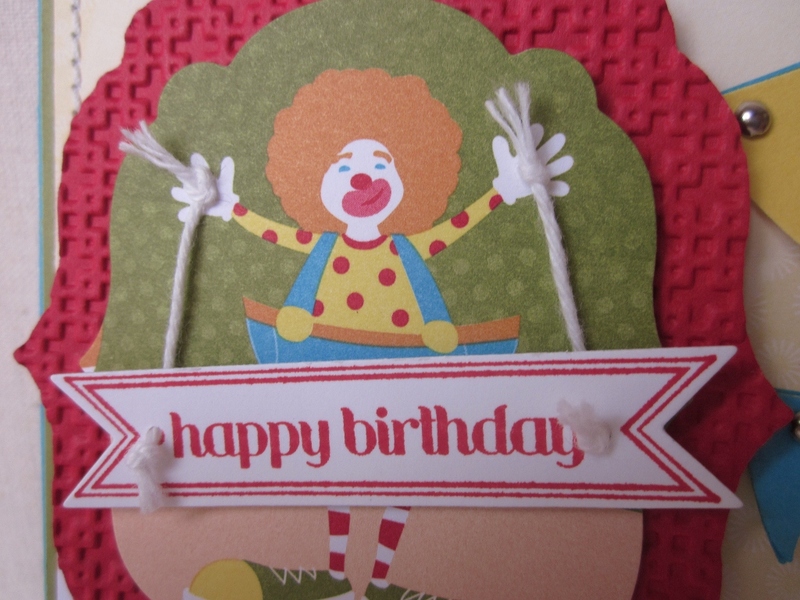 the little ties that hold up the sentiment are perfect with the clown's little hands in the air. Great job!